So far, so good! I love this quilt, as it's light enough for our Texas climate, but weighty enough to drape nicely. I had been looking for a reversible quilt in navy/gray, and this is perfect. I have a queen-size pillow-top mattress and purchased the king-size quilt. It fits nicely, with a little extra length at the head of the bed that makes for a nice fold-back option that exposes the opposite side's color. And even with that, it's still long enough to tuck in at the foot of the bed if so desired. I have not washed it yet, but other quilts I've purchased at overstock.com washed/dried nicely with no ill effects, so I'm hoping for the same with this one. Give your bedroom a quick and stylish update with this embroidered quilt set. Contrasting thread creates a subtle geometric pattern across the reversible quilt and each sham. This set is available in two colors to blend or pop with your existing bedroom decor. Dimensions 86.0 In. X 68.0 In. X 1.0 In. First, let me say - the quilt is lovely. It's super soft, and the colors (I bought the silver and gold) are gorgeous. Here's the PROBLEM: I have King sized bed. A normal king sized bed. As you can see from the pictures, the quilt doesn't even begin to fit!! I'm going to keep it (bc frankly, nobody can see the side of the bed away from the door). But, I am going to write the company. They enclose a little card asking for feedback, and I will provide it. So .. if you have a Queen sized bed, buy the king...Twin buy the Queen, etc. I just wish they #1 sized the thing correctly or #2 made a California King size I could have bought!! This Brielle Casablanca Quilt Set was a high end looking set at an affordable price. The weight was substantial and the pattern exactly as shown. Very contemporary but with some transitional lines to match any decor. I got a great deal on this spread and matching pillow shams. I love, Love, LOVE the art deco patterns quilted into the spread. It keeps it from looking to old fashioned. The color is exactly what I expected too. 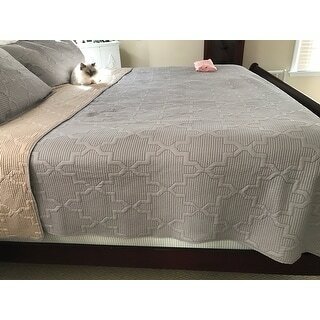 I purchased this quilt in dark grey/burgundy for my guest room. It’s beautiful and looks much more expensive than it was. I highly recommend! Made beautiful Great twin size awesome colors. So soft and great quality. Colors are beautiful. The colors are perfect for the room and it is a generous size. I use it on a queen size bed and I purchased a King size set....it fits great..
Great quality! Perfect for a guest room. It's a great color and it's versatile for many colored themes. It's a great solid yet neutral color. A little more “moving blanket” than I would have liked. The color is too washed out and it feels more stiff and I thought it would be softer. Hoping washing helps. The quality is not what I expected it to be. The color is not as bright. I didn't like the fabric. Very nice for the price. Love that it is reversible with burnt orange/ marine blue. Pretty soft. Haven't washed yet so don't know about that, but I really like the set. I bought the Carson Carrington throw pillows to go with it and they match nicely. The quality & color of the quilt were great. The unfortunate thing (as was mentioned in another review) is that is way to short on the sides. We too have a standard King bed and our bed frame comes up on the sides (i.e. no exposed box spring) and we have a thinner, european style mattress and is was still very short on the sides. So unfortunately I have to return. Great color and super soft. The contrast stitching is a huge plus. The size is perfect but it’s very thin and you have to have an extra blanket with it. It also slides off the bed pretty easily. The approximate weight for the king option is 8 lbs.